In a conversation the other day, a friend of mine implied that he was single because he was too smart. I didn't have the heart to tell him that it probably had more to do with the fact that he looks like the secret love child of Rick Moranis and a woodland creature. Alas, being single myself, I wondered to myself, “does being smart make it harder to find love?”. Intelligent people tend to have better foresight. Foresight, in and of itself, is basically just the ability to analyze a situation, recall relevant past experiences, and make an educated assessment of the future possibilities of the situation. Apply that mentality to a relationship and you get situations where smarter people are quicker to duck out of a relationship at the first sign of trouble. If experience is the best teacher, then the smartest people will rely on experience to guide them. Relying on experience to navigate a relationship can be tricky, though. Every relationship has similar situations. What ruined one relationship doesn't always have to ruin another, but for people who rely heavily on their experiences, they can often walk away at the first signs of trouble…. 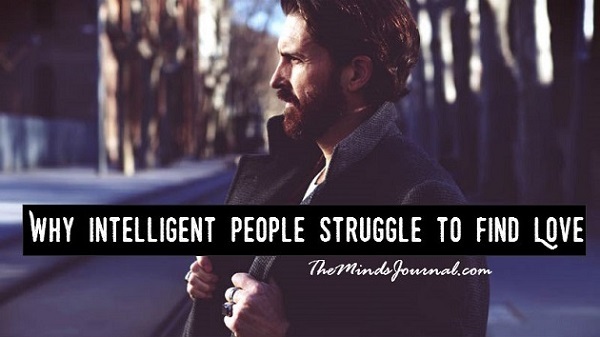 Highly intelligent people think analytically, even when it comes to things like relationships. Therefore, intelligent people realize that being alone is better than being with the wrong person. It's a rational, thought-out decision. So, in essence, most really smart people are single because they want to be. It is a rational, thought out decision – not a circumstance of their situation.